A Celebration of Jean’s life will be held at a later (warmer) date. Donations to St Jude’s Children’s Research Hospital, her favorite charity, may be made at: https://www.stjude.org/donate/donate-to-st-jude.html. 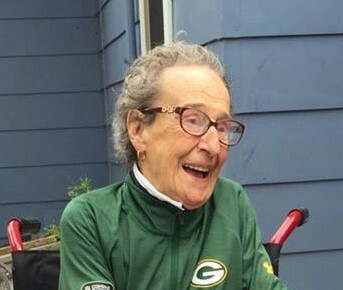 Jean (nee: Dorfman) Hankel peacefully entered Eternal Rest on January 31, 2019, with her daughter Barbara at her side at the age of 97. Born on August 26, 1921, in Wallington, NJ, to David and Ethel (nee: Dodds) Dorfman. She spent her early years in Paterson, Passaic, Clifton and Bergenfield, NJ, graduating from Eastside HS in Paterson in 1939. She moved to Saddle Brook, NJ and lived there until retirement in 1990. Jean then moved to Waterford, WI, where she lived until she joined her daughter and son in law in Salem, WI. Jean is preceded in death by her brothers, Robert and Joseph, her sisters in law, Marie and Arlene and her best friend for over 20 years, Mary Ingemann. She is survived by brothers Richard and Herbert (Marie); sister in law, Lillian; daughter, Barbara and her favorite son in law, Tom. Her greatest joy was spending time with her four granddaughters, Alyson (John) Ovitt, Elizabeth (Scott) Vickman, Catherine (Todd) Kellynd Emily (Christopher) Knipp. They lovingly called her Grandmother. She was GiGi to her 11 great grandchildren, Kaylene, Cohen, Taylor, Lowden, Cole, Cecily, Harper, Brody, Scarlett, Tobias and Bailey. She is also survived by 11 wonderful nieces and nephews, high school friend, Marie Zigarelli of Glen Rock, NJ, faithful “bar” buddy, Nancy Cayo of Silver Lake, WI and all the BPW members who brought meaning and purpose to her life. She was forever grateful to you all. For her 95th birthday she wrote this poem which exemplified the joy and blessings she brought to all who knew her. I really want this life to last. Cause am I really blessed, or what? The family wishes to thank Dr. Brian Hettrick, Heartland Hospice and especially her favorite caretakers, Mary, Mina and Toni for making Jean feel loved and cared for.